Yuval Harari looks into challenges facing mankind in his new book. September. 08, 2018 07:47. by Kyu-Jin Shin newjin@donga.com. 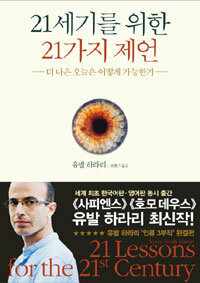 Israeli historian Yuval Noah Harari has written a new book on mankind following "Sapiens" and "Homo Deus." While the former two looked into the past and future of humankind, the new book categorizes the pressing challenges we face today, such as scientific technology, politics, religion, and education, into 21 themes and analyzes the cause of them. The most urgent questions on today’s global agenda cannot be addressed on a national level. Even if a pacific island decides not to exhaust greenhouse gas, it will be submerged under water unless other countries participate and do the same. Even if the U.S. government bans studying genetic engineering, it cannot stop Chinese scientists from doing it. The rise of authoritarianism and nationalism is palpable today as can be seen from the examples of Brexit and Donald Trump being elected as the president of the United States. This is a crisis for liberalism, which has brought peace and prosperity to mankind. The advancement in information technology and biotechnology has created an impression that the free will of humankind is the result of biochemical mechanism. The democratic system has improved its efficiency by distributing information and power but might face a crisis due to the commercialization of artificial intelligence (AI). As AI works more effectively when information is concentrated without being affected by the amount of information, it is highly likely to be abused by a dictatorship. Is there any hope for humankind?